​I am going to hunt those videos down and move them here. I didn't realize you were so busy, Sherman. I see lots of stuff down here in the wasteland. This wasteland is a public gallery of shame. So a moved the spam posts here. I don't know if you believe that all people are born with a conscience, an inborn knowledge of what behavior is good and what is not good. If you do then how would you explain people having a conscience if they are evolved. How do you explain "The Donald" and his motley crew of followers - where is his "conscience" and why have so many who claim to have strong religious affiliations willing to look the other way and elevate him to "cult like" status? Five years ago, putting "Donald Trump" and "evangelical Christians" in the same sentence would have been considered "blasphemous!" What is your proof that Trump has done anything illegal? So you think that those who voted for Trump should have voted for Hillary since she has such a spotless character? 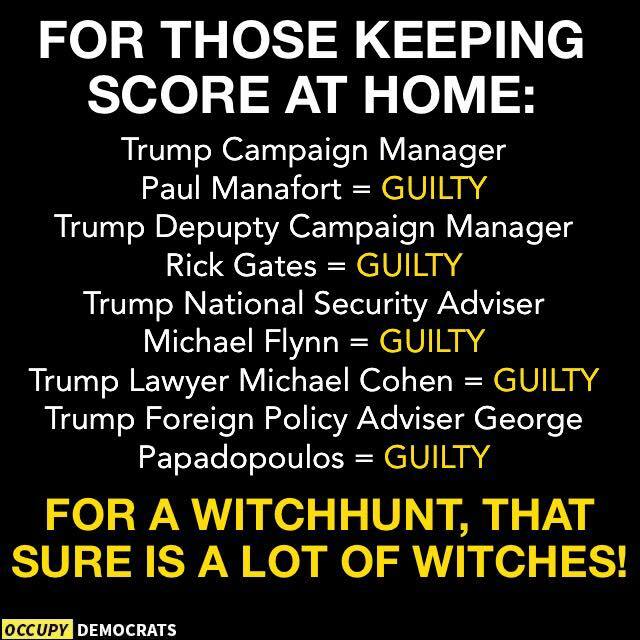 The one common denominator that connects all these individuals is "Donald Trump" - he has surrounded himself in his personal, business and political life with this "motley crew" who have been charged and/or convicted in the courts on evidence gathered by the Mueller Investigation! Trump hasn't been charged because the DOJ has decided that you can't charge a "sitting President" while he is still in office! Last edited by jgarden; February 20th, 2019 at 08:02 PM. You think that the people who voted for Trump should have voted for Hillary because her character is spotless! "My original belief after — well, after having conducted the investigation and towards the end of it, then sitting down and reading a binder of her materials — I thought that it was alarming, appalling, whatever words I said, and argued with others about why they thought she shouldn’t be charged." I am sure that the fact that Hillary's friend Terry McCauliffe donated $600,000 to McCabe's wife's run for office had nothing to do with Hillary getting off scott free! - a series of assassinations French Catholics massacred an estimated 10,000 Huguenots (Calvinist) men, women and children throughout France. Last edited by jgarden; February 21st, 2019 at 08:03 PM. That's all well and good unless you and your family happen to be one of the victims. Those wars listed in post 127, resulting in the deaths of millions of Europeans, can all be directly attributed to different interpretations of the Bible whereby one group of Christians sought to persecute/kill another group of Christians over their religious beliefs! It should also be noted that while "ok doser" dismisses the deaths of 3 million Christians (30,000 a year over 100 years), he also belongs to that group of "Trump" supporters who will go to great lengths to highlight the deaths of each and every American who suffers from a crime perpetrated by an "illegal!" This is being "POLITE". Seriously? The truth is that babies are routinely killed and Muppets like you think it's worth quibbling over when they are murdered. Hmmm.... I guess "Muppets" is fine. What are the rules again? Seems pretty subjective to me. An error on my part. I felt a loaded question was being put to me and jokingly replied with the classic example of a loaded question. Looking back at it I think I was in error in both cases and I apologize to the board. I do endeavor to be polite in discussions and humorous as well when the mood strikes me but I am not perfect. None of us are perfect, and it's a shame we have to constantly be on our guard....afraid of causing offence. I was using your post to make a point. One, I believe, needs to be made. Personally, I saw no problem with what either of you said, (but one was warned and one wasn't). Then it should have happened in my case.